Does anyone have an automated solution to import transactions from Splitwise? 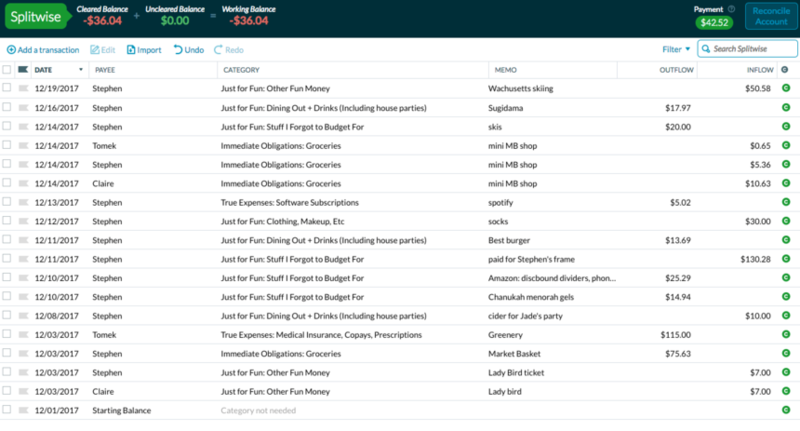 Getting all the transactions in as separate expenses is important so that the activity in YNAB and therefore budget is accurately reported. I use Splitwise, too -- what a lifesaver. It looks like you can export transactions from a single group or person as a .CSV file. You could then use File-Based Import to bring those transactions into YNAB. I tried this on my own budget, and used this CSV converter described in this YNAB Classic article. It sounds like a few steps, but it goes quickly! I tend to recommend not adding a Splitwise account in YNAB, though. Here's a quick video about the method I use. I'd love to hear how it goes for you, either as an account or not! I have been struggling this past week with the very same thing! I found a solution that works better for me than Jen 's method. I made a line of credit account called "Splitwise." I only use Splitwise with my two roommates and boyfriend and we use the simplify debts feature. So, they each get named a separate payee. When a new splitwise "bill" gets added to Splitwise, I enter it into this YNAB account. If I lent money to Stephen (ie, I payed for cider), then the amount they owe me goes in "Inflow." If Stephen lent me money (ie, he payed for dinner), then the amount I owe goes into the "Outflow." Be sure to select the budget category that matches how you logged credit/debit transaction originally, if you paid. The result is that everything gets added or subtracted from your budget categories and the "working balance" of the YNAB "splitwise" account will match the total amount you owe in Splitwise. Hannah Zoom how do you deal with settling up? I've been using your method, which I too prefer over Jen 's but when I settled up with my partner on Sunday, I was unsure what to do with the Venmo payment I received to basically zero out the Splitwise account in YNAB. Any help would be appreciated! Kat So, what I do is leave transactions in YNAB uncleared until we've settled up. This really just serves as an extra reminder to me to make sure that we do settle up (unless you just use simplify debts on Splitwise and just let it roll and never settle up, which works too, especially if you take turns paying for things). When I receive a Splitwise settling up payment, I send it to "to be budgeted." Since you've already been adding/subtracting from budget categories when entering the transactions in your Splitwise line of credit, you don't want to categorize settling up, which will silo it in your splitwise line of credit. Now on the other hand, if you are the one who made the Venmo payment to settle up, then you do want to mark it as a payment to your splitwise line of credit. If you find this difficult to wrap your head around, don't worry I do too. But, it works for keeping your budget categories straight which is what matters! The red boxes show categorizing a payment I made to Megan to settle up on Splitwise. The green boxes show what Keely still owes me. Bit of an update! When someone settles up with you, create a transaction in your Splitwise YNAB account equal to that amount as outflow, with payer as the individual (ie, not Venmo). This transaction combined with the Venmo deposit shown in your checking account should make everything accounted for correctly. Teemo I honestly don't pay attention to my credit card's available amount...maybe I should! I think manually adding to the budgeted amount for Visa is probably the way to go. PS: If anyone would like to see a video of how Hannah Zoom has set up her Splitwise within YNAB, I found a link to this video that will show you! Kat Hi! That link has expired for me - is there any way you could re-share it? The first reason is that this method adds a lot of extra work for you, with a lot of room for potentially frustrating errors. Splitwise is already tracking how much your partner owes you (and vice versa), so you don't need YNAB to do so as well. Tracking Splitwise in YNAB is twice as much work without any additional benefit. Secondly, tracking the Splitwise "account" as if it is a real account invalidates your budget. In other words, it adds or removes dollars from your account that haven't actually moved. So if your partner owes you $500 and you add that as a positive amount in the Splitwise account, you'll now have $500 in your budget that isn't actually there. This is true in the opposite direction as well. If you owe her $500 and the balance of the Splitwise account is negative, you'll remove $500 from your budget that you still have. The second point there is important, because it means you can't trust the numbers your budget is showing you. Instead, I'd recommend completely breaking these things apart. Use Splitwise to keep track of who owes who what, but only track what's actually happened in YNAB. That's how YNAB was designed to work, and it's the only way I'd recommend using it. It also really simplifies things for you, because you only have to worry about keeping your real accounts in line with real spending. To use the above method, you'd completely remove Splitwise from YNAB and instead only enter your actual outflows and actual inflows. When your partner pays you, that's Inflow: To Be Budgeted and you can categorize it however you want. When you front the bill, it's spending that you categorize just as you would any other spending. Again, I know this isn't exactly what you were going for, but in the long run I truly think this'll save you a lot of frustration. And it'll prevent your budget from being inaccurate, which should be our top priority. Hope this info helps anyone who's confused or having issues working YNAB and Splitwise together, and why it's actually ultimately better to keep it separate. It took a minute to wrap my head around, but after going on a 4 day trip with my partner where I paid for most things, we settled up last night, and then I did all my YNAB updating this morning, and my budget is still square, without having to stress! Kat This is fascinating... I understand the idea that keeping Splitwise separate keeps YNAB more accurate as a whole, but it also makes individual parts of my budget inaccurate. If my girlfriend pays $20 for dinner one night and puts it on Splitwise, that's $10 of food that I bought that isn't logged in my Food budget. If I pay $20 for the Lyft home afterwards and put that on Splitwise, that's $10 of money that I didn't actually spend on Lyfts for the month. That's a dealbreaker for me. I've really enjoy having a Splitwise credit account where I manually input everything from Splitwise after I've budgeted my checking account. It keeps all of the individual line items accurate in my budget and we settle up frequently enough that I'm not concerned about, say, $500 not being in my account like in the example above. The one issue I'm having with this system is the way that YNAB treats credit accounts. Sea Green Thunder I feel you, and this was my initial qualm with it as well, as I was using the same system mentioned earlier in this thread. But then I thought a bit more about what Jacob said about counting money that hasn't actually moved, and I reconsidered. Frankly I'd rather I know that the money I've spent is money I've got in my budget (by having the budget be dollar accurate) and have the theoretical side of the budgets be a little bit more or less than I would have actually spent had I not been splitting things. That's why the settling up needs to happen ASAP, because it keeps things accurate more often. You could theoretically reverse engineer it once you've settled up by allocating the incoming funds from the settle up based on the amounts from Splitwise, but that is an extra step I personally don't need. I definitely wasn't pleased to receive that answer too, but they are the experts in their system, so I'm sticking with what they told me is the best method. I definitely understand YNAB support's perspective, but for me I really want to make sure my budget categories are up to date, more so than my dollar amount. Also, I only settle up on on splitwise once a month...if you settle up more often you aren't using it right and you might as well just immediately Venmo, which is what I used to do pre-splitwise. So, something in considering trying for next month is setting up a budget category of "owe/d" money. When I categorize things I've bought that I expect to get reimbursed for, I'll use that category (splitting transactions if necessary). What do you think about this method? In addition to splitwise with roommates, I occasionally buy things that my parents then reimburse me for, so this would help me keep track of that and not think I personally had overspent a specific category. Hey Hannah Zoom ! I settle up on Sundays, which is frequently enough to not have to worry about its affect on my YNAB too much (it's usually just for a few things like groceries or a meal/movie), but not so frequently that it defeats the purpose. Plus I only use it with my gf, so it's just one person. I pay all bills and stuff with my roommate and send Venmo requests/get paid immediately when I settle a communal bill so that ends up not factoring. I think that the Owe/d category idea is a good one! Would definitely be interested to hear if it ends up working nicely for you. On a side note, in my conversations with YNAB support, I encouraged them to create a help document that discusses exactly the best way to manage YNAB + Splitwise, since it seems tons of folks are using it, and there's differing information even from their support channels being posted all over the place, both in the forums and on the YNAB subreddit. That way, people who want to integrate the two systems will have a definitive answer. Kat Hannah Zoom I'd love to hear an update from you six months later. I've gone both routes for the last half year now and I find that only the Splitwise account method works for me. I'm sharing groceries and misc. household expenses with my two housemates and I couldn't keep an overview about how much grocery budget was left. Not treating Splitwise as a separate account caused me to regularly overspend in groceries. I'm still very curious about what support suggested though, since I've got a similar response from support some months ago, and I'm not sure if I'm missing something. Thank you all so much for this wonderful information! How does all this work with the "Payment" aspect of the Splitwise credit account? Right now I'm owed money in Splitwise, and I don't owe anybody else money, but I'm still being told by YNAB that I need to allocate money to make a payment to the Splitwise account. $20 of my restaurant budget gets spent. $100 goes towards paying my next credit card bill. My splitwise balance goes up by $80. $90 of my therapy budget gets spent. My splitwise balance goes down by $90. my splitwise balance goes down by $325. my venmo balance goes up by $325. How do I set up YNAB so splitwise stuff works this way? I have slightly different method. If you roommate pays for the internet, and your share is 50$, that should just come out of your "Internet" budget once you send your roommate the money. I needed a way to track my true expenses, while not having to scavenge off of my other budgets in order to "lend money". For this, we need a "Lend money" budget! I determined I never go above 300$ (owed to me) in splitwise. So I created a budget Category called "Reimbursables 300". If my splitwise was at 0$, this budget would have 300$ available. If I split groceries with a friend, I split the categories for that transaction between my "Groceries" and "Reimbursables 300" budget. When the friend pays me back for the groceries, it's an inflow into my "Reimbursables 300" budget, which goes back to having 300$ available. This is it! I hope it helps! Alex After a few tweaks, I opted to create a "Splitwise" account instead, to which I add my split transactions. My problem with the above setups is that they assume that settling up will happen relatively often. However, I use Splitwise with close friends and family exactly to avoid having to settle up. For example, if my sister buys the catfood ($60) then she'll put it on the splitwise and I will owe her $30. I want to track this on my budget under the category budgeted for the cat. However, I won't ever withdraw $30 to settle up with her. Instead, maybe later I will pay for the internet ($80) and put it on the splitwise so she will owe me $40. Now our balance is that she still owes me $10. Again, this will never be settled, if it gets too large then it is her turn to pay for the things we're sharing from her account. For YNAB to work for me, I need it to handle this use. In particular, I need to be able to correctly associate the money that was split into the categories I budgeted for. i.e. Even though $80 came out of my credit card, only $40 of that needs to be associated with my budget for the internet. Oppositely, I need to be able to indicate that $30 were spent from my cat budget, even though none of my linked accounts will actually have that transaction listed. Alex 's method almost seemed to work, so I made an account with the free trial, except I now realize that this is not working. Outflows happening once you "send the money" doesn't work in my usage of splitwise, because the debt is never settled. I am very interested in making ynab work for me but I do not know how to achieve this critical aspect of the way I manage money with my friends and family. It might be easier to leave that Splitwise account out of YNAB -- it can be messy to keep updated. Instead, the very best way to handle it is to settle up frequently. When that's not possible, split-transaction gymnastics can come to the rescue. 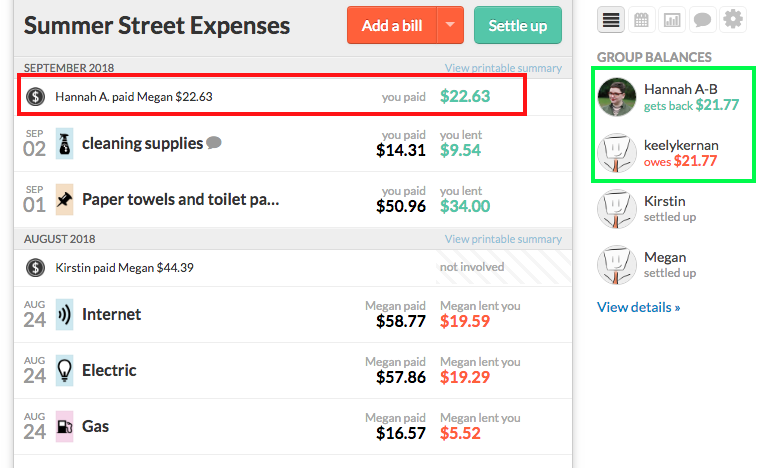 When you do settle up, each line item in Splitwise will be a split in a YNAB split transaction. Faness Thanks for your reply, unfortunately this isn't going to work for me, or perhaps I don't understand you. I understand your suggestion is to settle up frequently and that YNAB will like that more. However, this is not how I use splitwise, and that is unlikely to change. If YNAB can't handle this usecase then it is a limitation of YNAB. In your example, you have only one transaction on one date somehow accounting for all those various things. I need this to work over time. On one day my sister pays for the cat food, I need to record that half of that expense I budgeted for was paid for, not by any of my accounts, and I owe that on splitwise, but will never settle that debt. Instead, on a later date, in a different transaction coming from my credit card I will pay for her portion of the internet. My budget should reflect that half of that transaction is coming from what I budgeted for the internet, and the other half is coming from the debt I owe my sister from her paying my share of the cat expenses. Effectively, this is a roundabout way of moving some of my budget from cat spending to internet "overspending". But I definitely am not going to do that calculation manually, and it isn't accurate to say I'm overspending on internet. nabla_keeper With the method I mentioned, you'd only enter the transactions when you made a purchase that included repaying your sister. For instance, even if your sister purchased cat food January 1st, you wouldn't include the cat food in your budget until you made the internet payment - that's the day you're taking those funds out of your budget/checking account. For Reimbursements, we suggest a Reimbursements category to keep track of those expenses. Then, when you receive the reimbursement, you can apply it back to the Reimbursements category to keep things squared away. Using this approach with Splitwise, you'd have to determine when to consider yourself as having been reimbursed. If your sister buys cat food, is that $30 subtracted from your cat food category and $30 added to Splitwise? Then, when you pay the internet, it's taking that $30 from Splitwise (plus an additional $10, leaving the category overspent) and $40 from your internet category? This gets a bit trickier, which is why we suggest entering the single transaction to account for all splits (but I understand you want to avoid that since you don't settle up). Hi Faness Thanks again for your reply. However, I am quite disappointed by this solution after trying it out a bit. After thinking more about why I dislike these options I have a solution that I would like to run by you and you can let me know what you think about how it aligns with the ynab philosophy. This is very similar, maybe identical, to the solutions detailed above. Kat mentioned above that they were convinced away from this method by Jacob from YNAB support, because it doesn't reflect the reality, but I think I disagree so am interested in hearing the objection to this method explained more clearly. The central point of this proposal is to treat Splitwise as a line of credit. I think this is consistent with reality because I really am taking on a debt, but instead of a bank the debt is held by, for instance, my sister. If she spends $50 on catfood, then my budget SHOULD reflect that I have $25 fewer dollars in the form of a debt owed. If I spend $100 on internet, $50 of that is debt I own from my sister. I don't see why this asset shouldn't be considered money I own. Like any asset, an investment for instance, we could suddenly stop talking and I'd suddenly lose this money. But by issuing this debt, taking it on as an asset, I am accepting that risk. So I create a line of credit called splitwise. Everytime my sister spends something we're sharing, I log my share of that transaction as an expense. This is great because the expenses are itemized individually, and can be applied directly to their appropriate budget categories! I can also get a sense of how much debt I've taken on, or am holding. When I spend money on a shared expense, this should look like paying down the debt that I've taken on in splitwise line of credit. That is, my portion of the expense should go to the budget category, my sisters portion of the expense looks like a transfer to that line of credit. I believe this system is consistent with reality, relatively easy to maintain, and clear about what money is going where. My sister pays for the cat food, $50, my portion is half so I record that as a transaction from the line of credit into the "cat" category. Now, when I pay for the internet, there is a credit card transaction of $100. $50 goes to my internet budgeted category. If I ever do settle up with my sister, I just record that as a usual transfer from chequing to the splitwise. I believe this is a solution to my scenario, and how to this thread. Please let me know if you can anticipate any problems with this. One thing I will say is that, while this works on the desktop browser, this does not work on the mobile app. The reason for this is that the split mechanism is different. On browser I am able to list one split category as a budget category, while the other split category can be the transfer. On mobile only budget categories are available during splits, not transfers. If that could be fixed then as far as I can tell this is a sustainable solution. Let me know what you're thoughts are on this. nabla_keeper Ah, okay, so what I described above is kind of annoying, I now see that the credit card will show that I've under budgeted for the amount that is being transferred to the splitwise line of credit. Is there some way I can create a category to accommodate this? Something that would correspond to saying "I can budget taking on $300 in splitwise debt this month". This way when I transfer to the splitwise line of credit it would use that budget category to cover what's missing in the credit card? nabla_keeper I see a few possible issues here. You've noticed one of them: transfers from credit cards are seen as cash advances and can't be budgeted for in your budget. That overspending alert will stay present in your budget until the month rolls over. Also, a positive balance on a credit account is treated like cash. So when your Splitwise account shows that positive $25 balance, you'll see $25 in your To Be Budgeted. You'd then have $25 of your sister's money in your budget, but budgeting it might be tricky since it would depend on the next Splitwise expense she covers to use that $25. This also means tracking expenses in two accounts - your credit card or checking account and the Splitwise account - which is another point towards not reflecting reality. Initially, choose to split the category, then choose two categories (any spending categories). Click Next, and then tap on one of the splits. The category field will be empty, and you can tap the back arrow to go back to the transaction splits. Tap Done after assigning money to each split. Faness Yes, these are good points. However I think I am okay with treating the positive balance as an asset that I can anticipate being budgeted. Is there really no way to automatically budget for cash advances from the credit card? If there's some way to accounting for the annoying overspending alert, by for example, budgeting for how much splitwise debt I am comfortable holding, then I would prefer to use this method. Again, your way of breaking down the settling up, or splits I pay for, is very not ideal. For one thing I do not want to manually do the work of splitwise to determine which aspects of previous sister expenditures are being "covered" by my transactions. Especially because those aren't whole numbers. Currently, there is no way to get rid of that overspending notice in the account register. It's meant as a reminder, so you can budget those funds directly towards the credit card category to cover the cash advance, but the reminder stays there until the month rolls over.